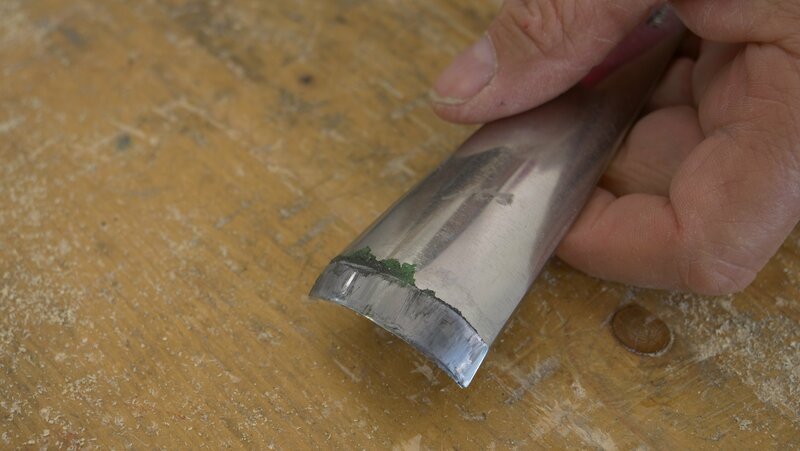 Note: This is the sharpening process of an out-cannel gouge. 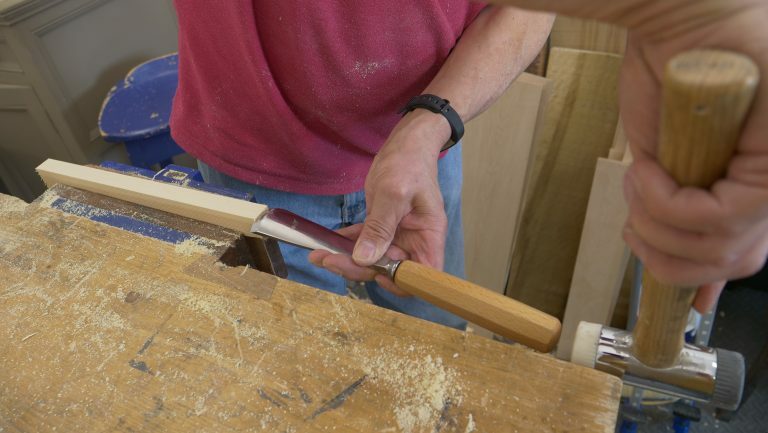 Paul recommends 2 methods to sharpen an out-cannel gouge which can both be done on diamond plates or abrasive paper. 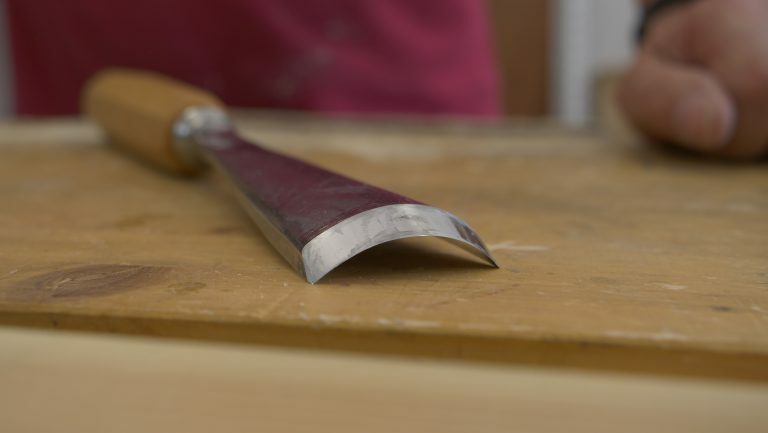 You will also need a curved strop, which you can make yourself, to polish at the end of the sharpening process, for this you will need a concave one and a convex one (to polish both the inside and outside of the bevel). 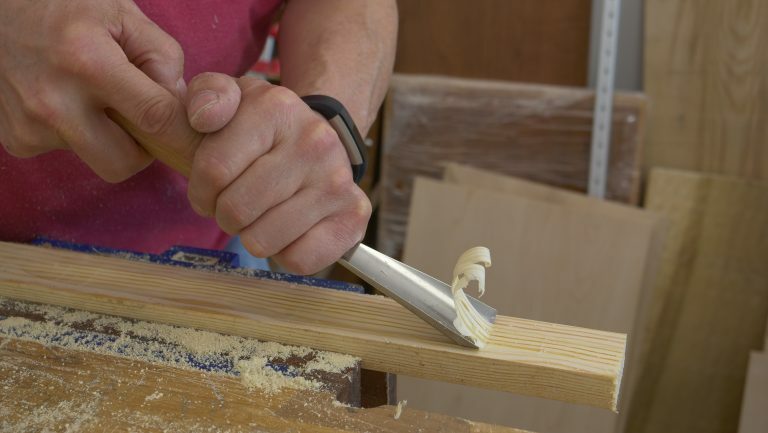 To use the figure of 8 motion, start at the bottom left corner, use the corner of the gouge as your starting point at 30-35°. 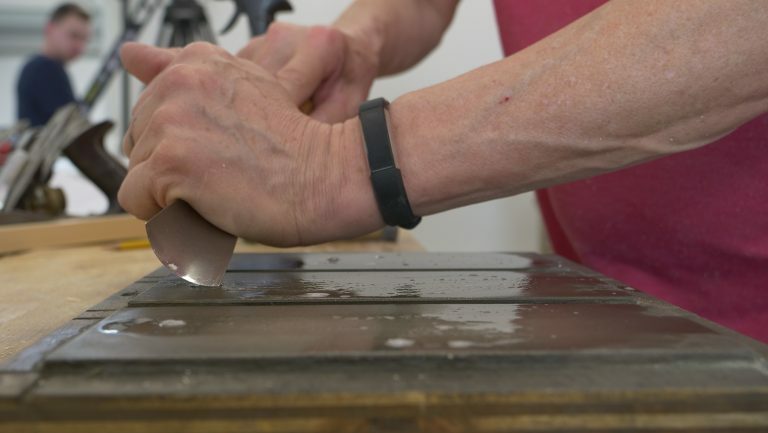 Push forward and roll the bevelled edge from one corner to another until you reach the top right corner of the sharpening stone, move across to the top left. 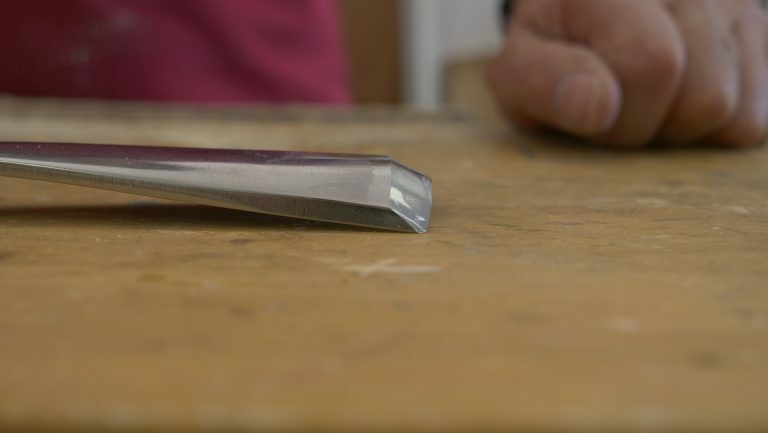 Keeping the bevel in contact with the sharpening stone, move backwards, roll the bevel back round to end up at the bottom right corner. 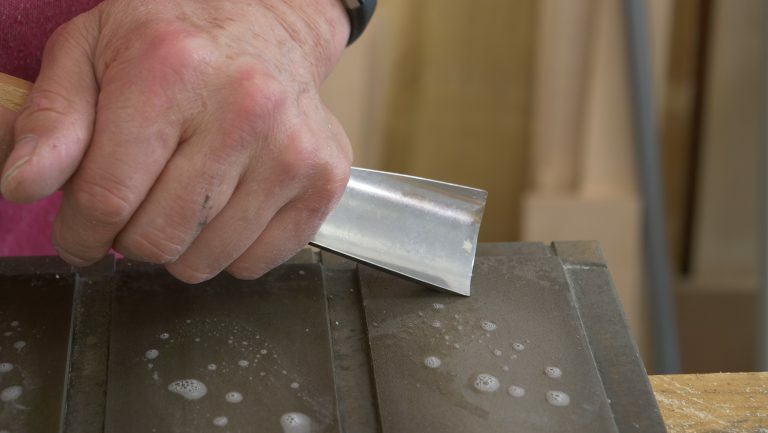 An alternative sharpening method is rotational sharpening. 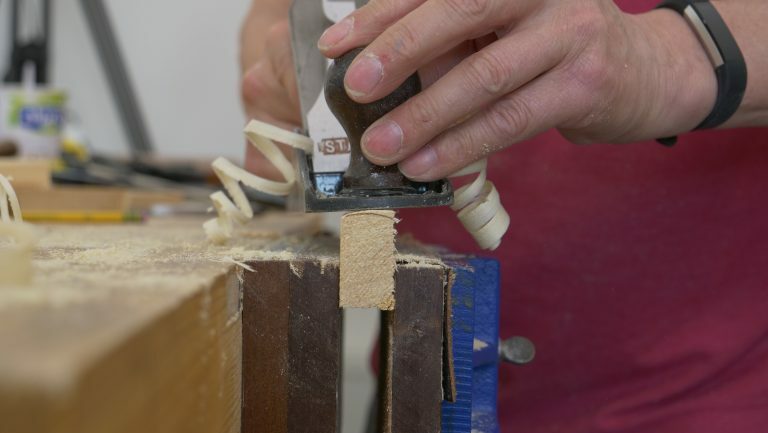 For this method you do not use a figure of eight motion but instead, use a straight back and forth motion to sharpen the edge, rolling the bevel from corner to corner as you go. 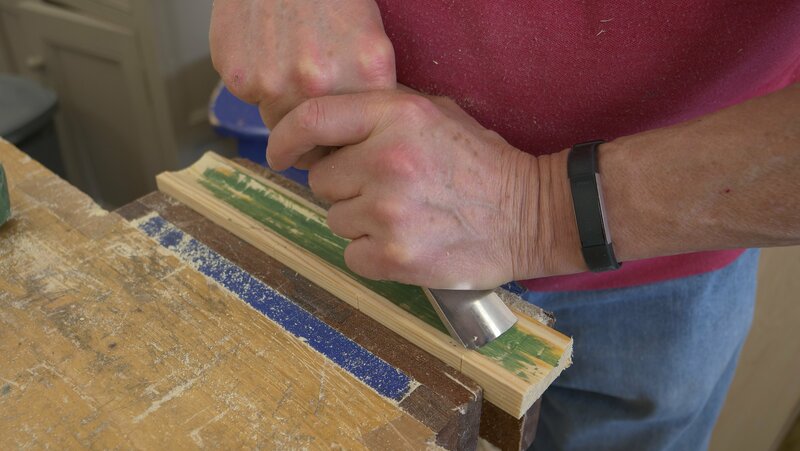 Repeat steps on the fine plate, abrade until coarse marks have been removed, then super fine, this creates a camber on the edge which works well for carving. 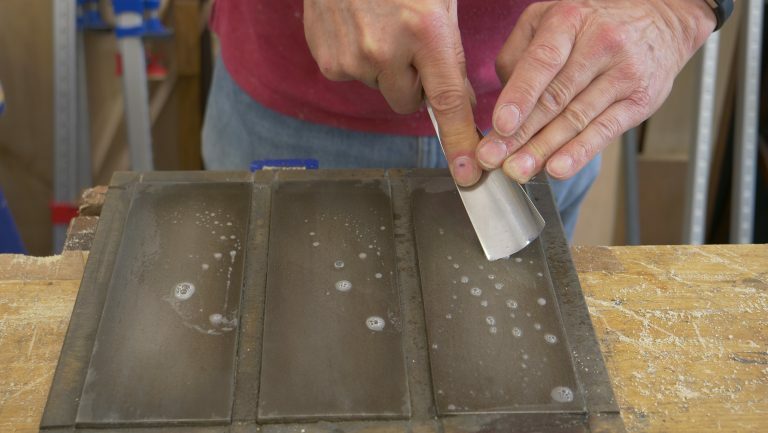 Use a purpose built strop to polish. 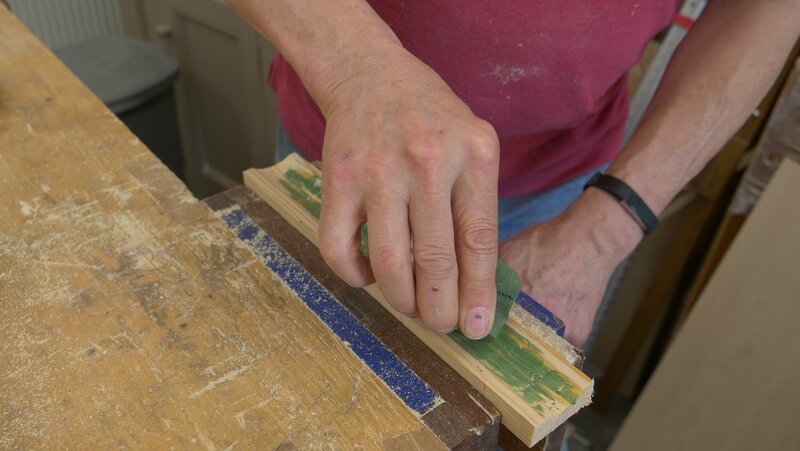 Apply buffing compound to the surface and pull the gouge 30 times over the strop, more if necessary keeping it at 30°. 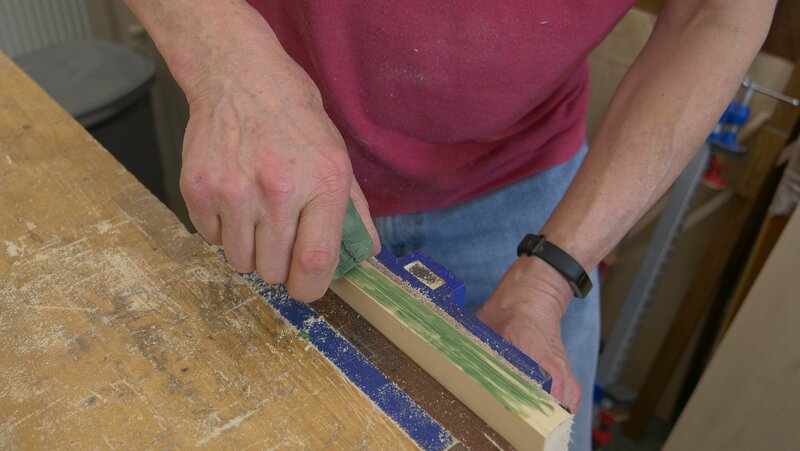 When sharpening bench chisels we generally remove the burr on the back with the 1200 diamond stone before stropping both sides. 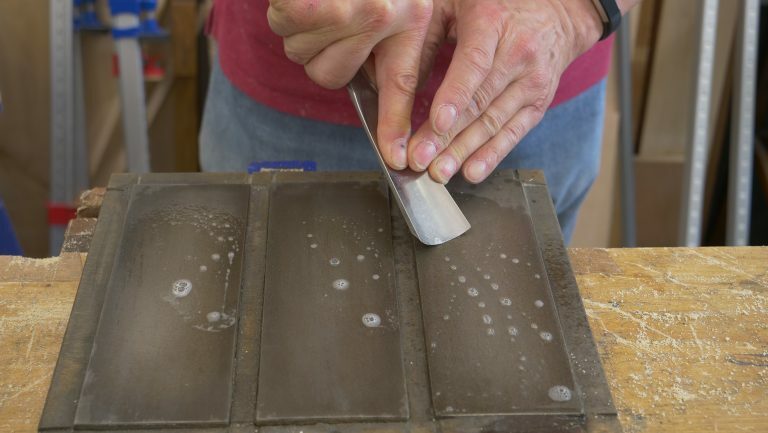 Should we use a shaped slip stone (diamond, or oil?) 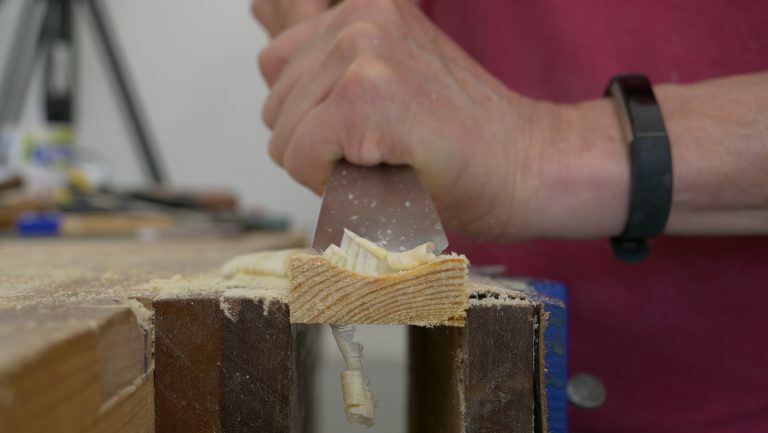 in an extra fine(1200 or so) for the inside of the gouge before stropping with the shaped wood/leather strop. 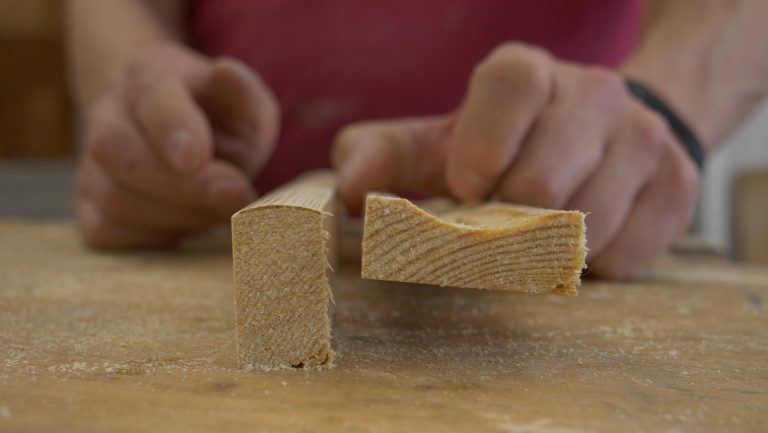 It seems there would be a substantial burr on the inside curve since we are sharpening with a course, med and extra fine diamond stones on the bevel and that only using a shaped strop would take a long time to remove a burr? 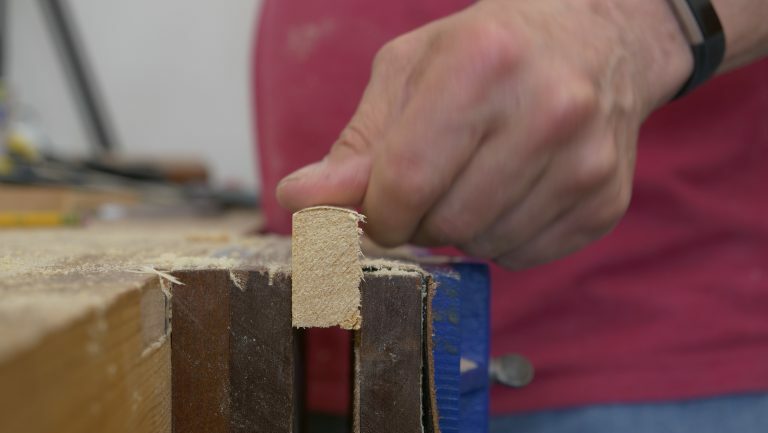 Generally we polish out the inside of the hollow area and then sharpen the bevel and then strop the bevel and we never have to touch the inside except to remove the burr which we can do with a round strop. 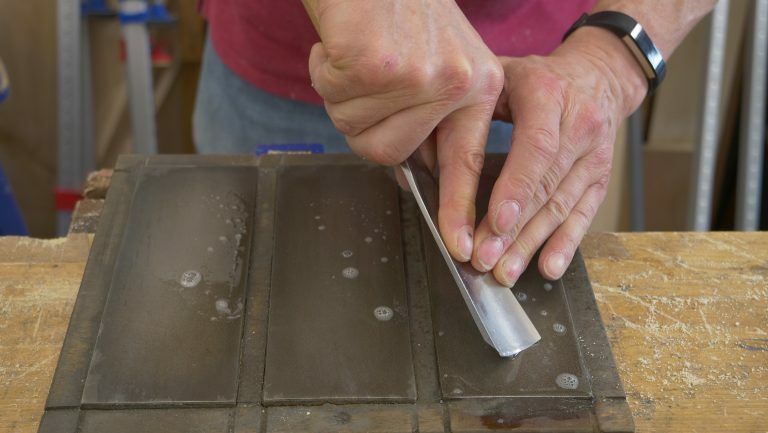 Good to know we dont need anymore than the diamond plates and a shop made strop as described. Thank you again for all of the concern and great advice!